The thing I enjoy most about doing this blog is not only sharing great music with other people, but having the opportunity to learn about new (or in this case, old) music from other people as well. Someone requested this a week or two ago and I figured I would hunt it down even though I had absolutely no idea who The Lines were. It turns out that The Lines were a post-punk group that played and recorded between 1978 and 1983 to little critical acclaim. These guys would open for The Birthday party, Bauhaus, and The Cure but never really found their own distinct fan base. Acute was kind enough to put this compilation of the band's collected work together to keep them from being completely forgotten by time. I'm not really sure why the band never gathered the praise and admiration that many of their peers received. 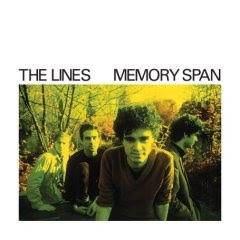 The songs on Memory Span are extremely accessible and really varied, covering the gamut from poppy angular rock songs to the darker and more mature post punk they created toward the end of their career. Fans of The Feelies, Wire, and Gang of Four will love this. Thanks again to whoever requested this album, It hasn't left my car CD player in almost a week now. While we appreciate your interest and your desire to share this music with people, we'd appreciate it more if you didn't share the entire thing! Feel free to post a song or two, but please take down the link. The CD can be purchased from us, from most stores, or downloads can be purchased from iTunes, Other Music, Amazon and many other sources. love what you guys do. got any other blog recommendations?